Purpose: Use this document as a reference for accessing advisee information in ctcLink. Note: The Advisor Center tab is only visible to faculty who are also advisors. 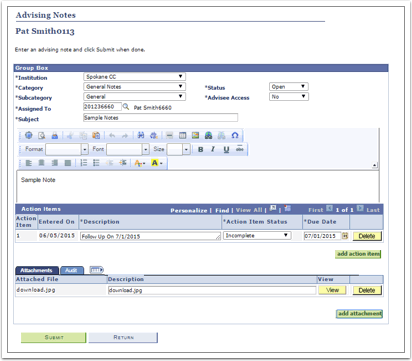 The My Advisees section only displays if the advisor has been assigned advisees. The My Advisees tab lists all students actively assigned to an advisor. If an active email client is available (i.e. Outlook), clicking the student Name will open a new email window with the student email in the To: field. Clicking View Student Details will open the Student Center tab for that student. Click the icon for Advising Notes to enter or view additional information about the student’s advising history. A list of notes will display, click the Advising Notes icon to view a specific note. Click Submit to save the note. 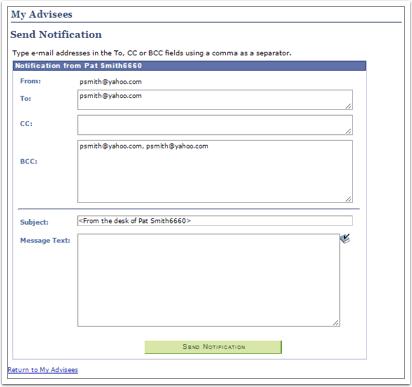 Notifications can be sent to selected students. Check the box in the Notify column to select specific students or click Notify all Advisees. Enter the appropriate message in the Send Notification section. Click Send Notification to send the email. To search for other students that are not assigned to you, click the View Data for Other Students button.